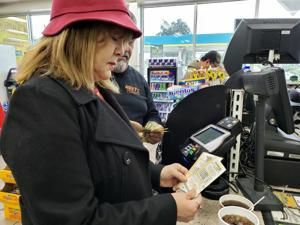 Santa Rosa resident Aida Mendoza reviewing the lottery tickets purchased by her husband Margarito, who is standing next to her at the local Stripes store yesterday for tonight’s game. Eric Hoff says it to all his customers buying lottery tickets at Bottle Shop liquor store, even though t he odds of winning the jackpot aren’t good, at one in 302.5 million. But he’s been saying it more and more lately now that his customers are chasing the second largest jackpot in U.S. history, worth $970 million as of last night in the Mega Millions game. And, someone has to win eventually. The person or people who do, if it’s tonight, would win $548 million on the cash option or annually paid for 29 years. Standing behind the counter scanning a single game ticket for a customer, Hoff recalled many of his customers who have won big money prizes from the store, but never the Mega Millions or Powerball from his store. He said by the time the game is all said and done, the pot is going to be bigger because of all the ticket sales. At $2 per ticket, the massive profit for any winner is going to be life changing. Hoff called today’s game a frenzy that is sure to attract more players right up to ticket sales close. “ You can’t win if you don’t play,” Hoff said. Santa Rosa resident Margarito Mendoza, a retired math teacher agreed with Hoff’s adage — if you don’t play you can’t win. Mendoza picked up 10 tickets with his wife Aida hoping their six numbers magically match the ones picked tonight. “ If you buy at least one ticket you have a one in a million chance to win,” Mendoza said. In Santa Rosa, a convenience store manager said the store had already sold plenty of tickets over the week and yesterday. He said the store traffic is going to be heavier than usual today and he’ll be ready for the many ticket buyers he believes will be coming in as late as 9 p.m. tonight.